Once upon a time, chandeliers were reserved for grand dining rooms and lavish hallways. But now we’re seeing these glamorous light fitting being used everywhere. One of the most unusual places though, is the bathroom. Bathroom chandeliers are becoming more and more popular for people who want to give their powder room a glittering and glamorous look. Traditionally, bathrooms would be lit by a simple glass flush ceiling lights or spotlights. Whilst these are a practical choice, they leave little to be desired in terms of style and ambience. Thankfully, home owners can now add a little more style and imagination to bathrooms with the arrival or waterproof, IP rated chandeliers that are safe for bathroom use. These speciality chandeliers are perfect for hanging in the centre of a bathroom for a statement look. If you’re thinking about adding an elegant chandelier to your bathroom, there are a few important things to consider before buying. These questions will help to determine if a chandelier is right for your space. Is your space big enough? 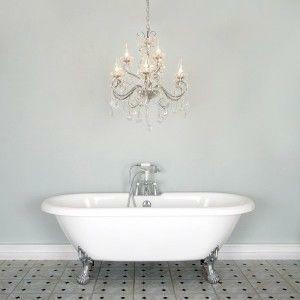 Chandeliers tend to work best in large rooms and this rule works for bathrooms too. If your washroom leaves a lot to be desired in terms of space, a chandelier could make the room look even more cramped. Their grandiose design works best in larger rooms where they won’t impose on the rest of the fixtures and fittings. Will it match your style? A bathroom chandelier is perfect for creating a glamorous look. But will it fit with your current style? If your bathroom is masculine and minimal, an elaborate light fitting may stand out like a sore thumb. On the other hand, if your bathroom already has a lot going on, a chandelier may be too much. 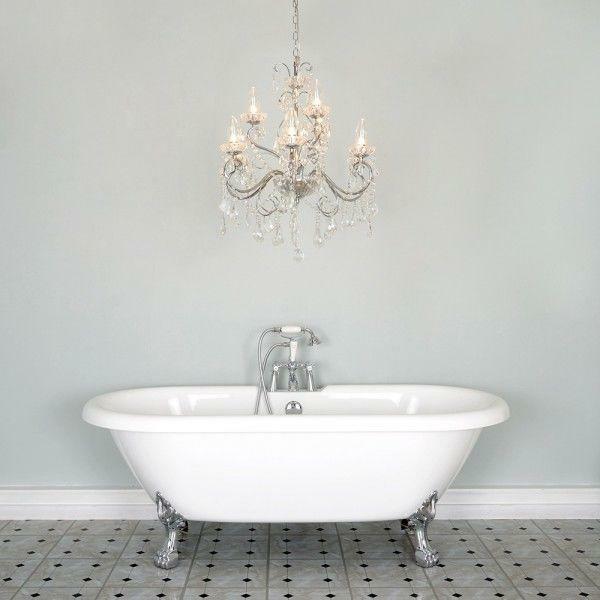 We suggest pairing a bathroom chandelier with a simple but chic bathroom design. Think roll top baths and elegant fixtures for a luxurious boudoir feel. When it comes to choosing a bathroom light fitting, there are safety factors to consider. Due to the amount of water and steam, bathroom lighting needs to be suitably IP rated for the area it will be installed. Luckily all of our bathroom chandeliers are IP44 rated, which means that they can be used in bathroom zones 1 and 2, as well as dry zones (must be connected to a 30mA RCD protected circuit for zone 1). Find out more with our guide to bathroom lighting safety regulations. If you think a bathroom chandelier would look amazing in your home, look no further. Our stylish Vara bathroom chandelier collection is perfect for people looking to add a little glamour to their washrooms. 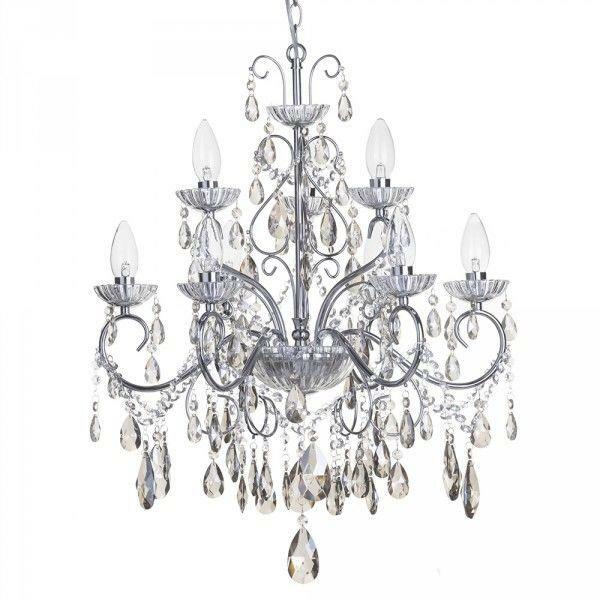 For a classic look, the Vara core range comes with clear crystals and is available in a range of sizes including a compact three arm chandelier, a five arm chandelier (above) and an elaborate 9 arm version. This classic design is perfect for creating a sleek and simple look in your bathroom. For more of a statement look, the Vara range is also available with coloured crystals. 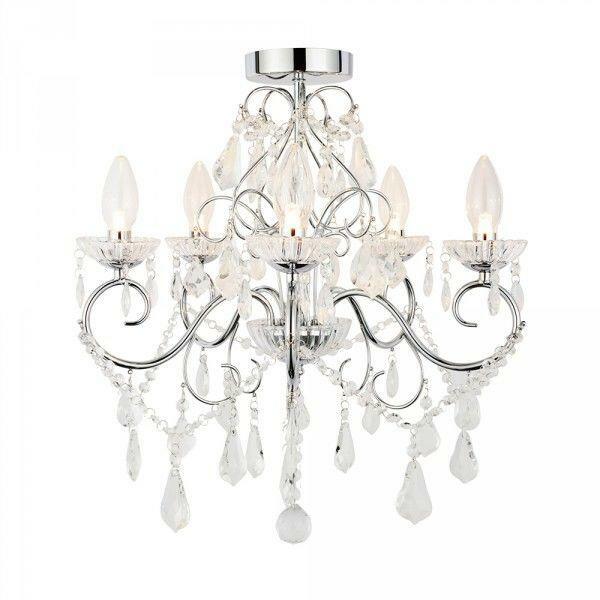 New for 2015, this amazing range features a traditional bathroom chandelier that has been updated with coloured crystals in a range of trend-inspired shades; choose from champagne, red, smoke grey and black. 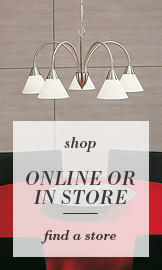 Choose the Vara chandelier range with luxurious champagne coloured crystals for a chic, spa-like feel. This warm, muted tone is perfect for pairing with ivory and gold fittings for a softer, more subtle look in your bathroom. For wow-factor, choose the 9 light champagne chandelier. 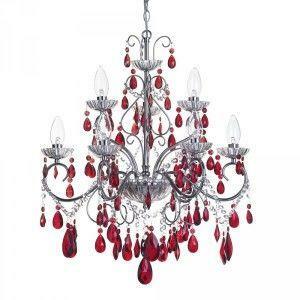 Bring a bit of drama to the bathroom with a vibrant red bathroom chandelier. 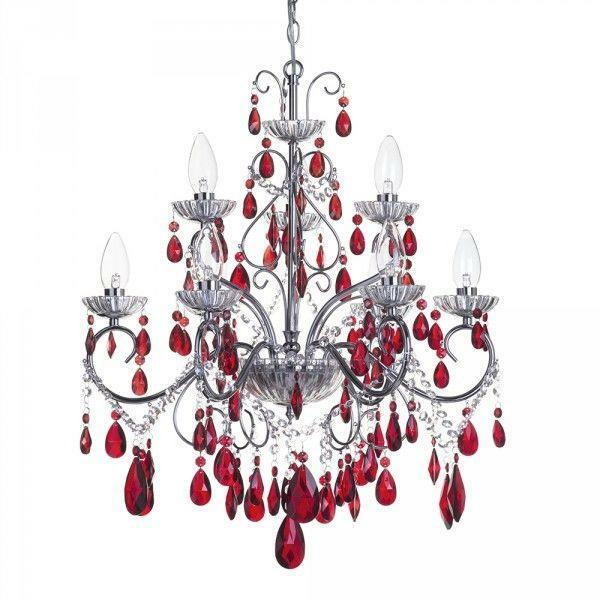 This Vara 9 light chandelier features a polished chrome frame with sparkling red crystals for a contemporary twist. This ruby-coloured look is brave and bold, perfect if you like to add a pop of colour to your home. 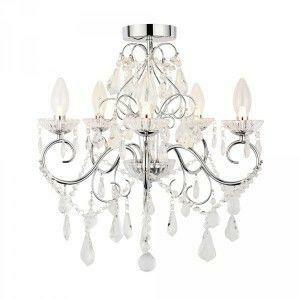 This stunning chandelier is also available as a 5 light chandelier for a more compact look. 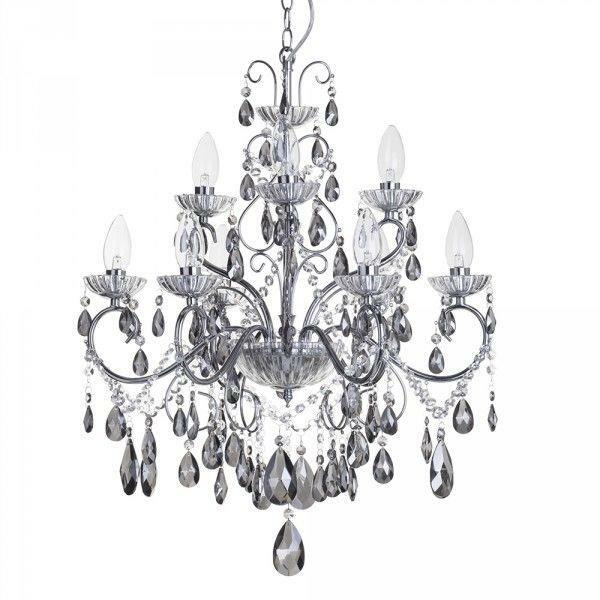 For a sultry and smokey look, the Vara bathroom chandelier is also available with black or soft grey crystals. If your love the monochrome look in your bathroom, this choice of two tonal crystal chandeliers are great way to add some subtle sparkle to your decor. Choose the smoke grey chandelier in a mini 3 arm version if your bathroom is a little on the small side. 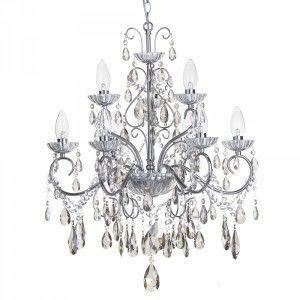 Once you’ve chosen your perfect chandelier, you will be eager to get it up and looking great. As with all bathroom lighting, bathroom chandeliers often comes into close contact with water, so it is very important that they are fitted well and comply with safety standards. For safety reasons, we strongly advise that you contact a qualified electrician to install your bathroom lighting safely and correctly. If you think your bathroom could benefit from a beautiful chandelier, visit Litecraft to view our full IP44 rated bathroom chandelier range.